This is part of an ongoing series about where essential oils come from! I’m kind of a supply chain nerd. Ever since I started designing fabric I’ve been fascinated in the whole process of delivering an idea to a customer from sketch to quilt and everything in between. The same is true of essential oils and as they become increasingly available and popular the transparency of how they are sourced must be made more clear. Essential oils are one of those things, that for a lot of people, just kind of appeared on store shelves, our facebook feeds or Pinterest boards… In the past you might have seem them in health food stores, if you had a gluten/nut/dairy allergy before that was a thing (basically any time before 2012), or you might have been familiar with them if you had a particularly crunchy parent. Because we’re being presented with this “new” thing (not actually new in any way), in so many ways, essential oils might not be something that you’ve considered how they’re sourced: who made them, where they’ve come from, or in our modern world, who’s getting stolen from/taken advantage of, mislead in marketing and other myriad things. 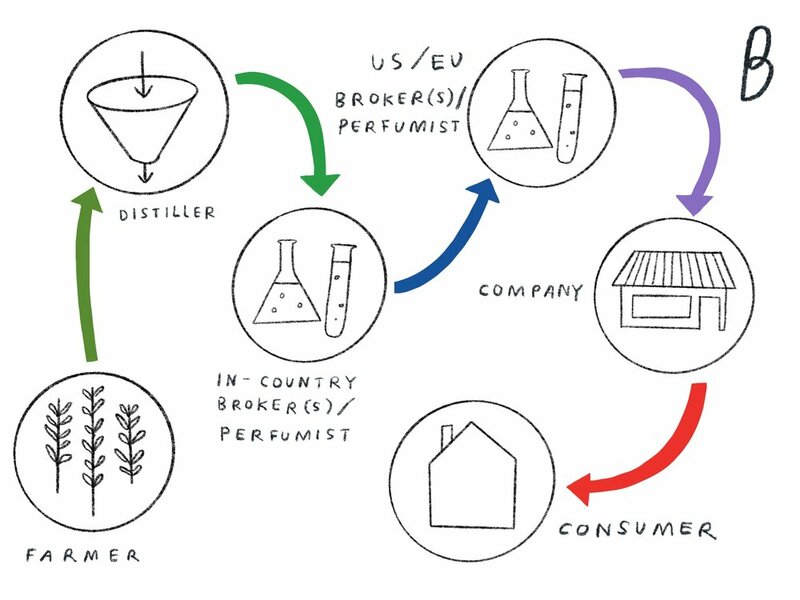 This is the process essential oils you see in Grocery stores, and other big Box Stores, and new rando companies popping up in ads everywhere go through to get into your hands. The essential oil industry is full of cut corners. The oils can be cut, and extended with fillers that are potentially harmful, or made to smell more like the plant from which it came… or have chemical constituents added to them so chemically it appears as it should on a test. This whole process of cutting and extending starts again when the product is moved from broker to broker. The system, more often than not, starts broken, and it’s typically the people who are the most vulnerable: the farmers, growers, harvesters and distillers who bear the burden of these cut corners. Farmers aren’t paid fair prices for their labor and plant matter. 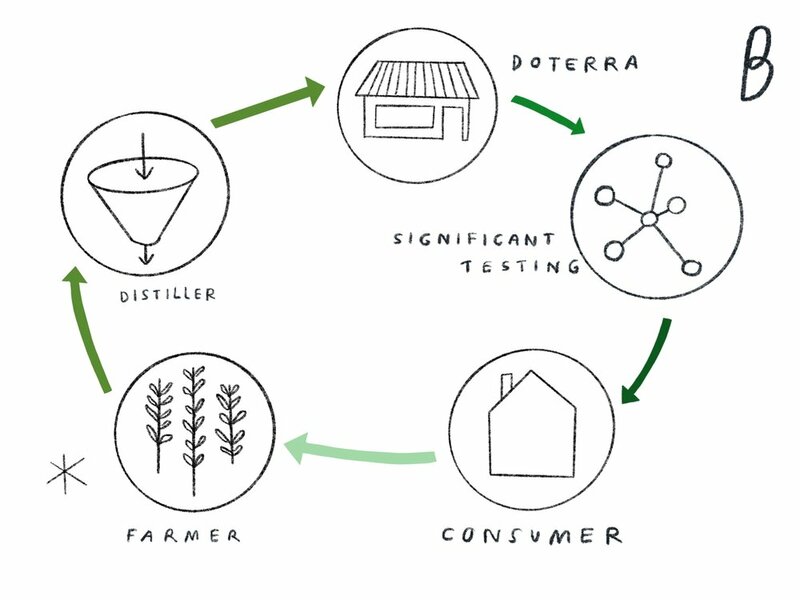 Distillers use chemicals to extract more from or extend plant matter. The oil is taken to or shipped to in country brokers who might potentially all have different objectives. Every person in that chain is looking to get paid. As you continue down the road of transparency, ethics and fairness in how you consume; whether it be your clothing, your fabric, your food, your cosmetics, even your information, don’t let essential oils be something that you exclude from that equation. There are people on the other side of the world who make this kind of healing available through their labor, and if you and I are going to participate in this process by using essential oils for our benefit, then it’s our job to make sure they are supported and lifted up for their contribution and benefit. To learn more about doTERRA’s Co-Impact Sourcing and where doTERRA’s oils come from, click the button below.